The Catalyst 2960-L does not support stacking. But the Catalyst 2960-L switches support virtual stacking for single IP management. Up to eight switches can be configured and managed a single IP address. What’s the Virtual Stacking? And what are the main features of Virtual Stacking? In the following guide we will introduces Virtual Stacking and Associated Terminologies, and the requirements for Virtual Stacking. Note: Support for Bluetooth over the air requires a Bluetooth dongle to be connected on a USB port and Cisco IOS Software version 15.2(5)E2 or later. Before configuring virtual stacking, users should understand the various terminologies associated with it so they can effectively design their stack. Cluster domain: Group of switches that are interconnected to each other and share a broadcast domain; a maximum of eight switches can be in one domain. A virtual stack is essentially a cluster domain. Virtual stack address: IP address of the cluster domain that would be used to manage and configure all the switches in the domain; this address can be either IPv4 or IPv6. Commander switch: A switch from the cluster domain that acts as the single point of management for all other switches in the cluster domain by assuming the virtual stack address. Any switch in the domain can be configured to be a commander switch, and there can be only one commander switch. Standby commander: One switch in the domain can be configured to act as a backup in case of failure of the commander switch. This switch can also be any switch in the domain that is configured to take over the virtual stack address after the commander switch fails. 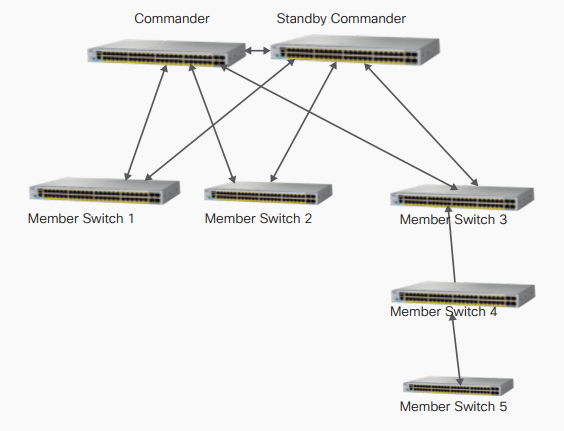 Member switch: Switch that is already part of the cluster domain but is neither the commander switch nor the standby commander switch. Candidate switch: Switch connected to the network that meets all the requirements and is capable of joining the cluster domain. Although there is no need of any additional hardware to enable this feature, there are certain requirements before one can configure virtual stacking. 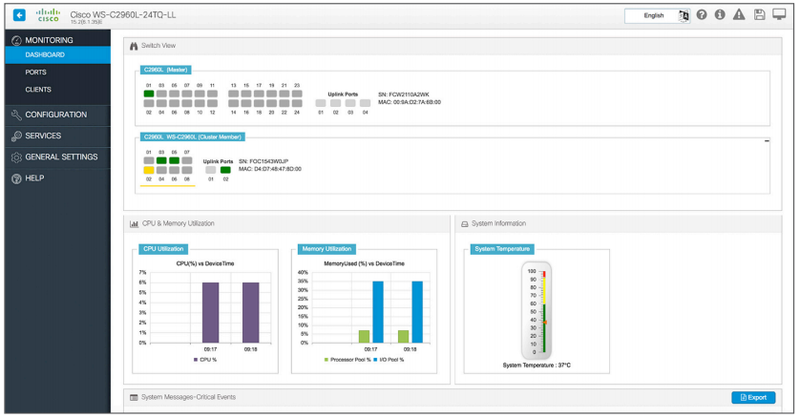 Cisco Discovery Protocol v2 should be enabled on switches that would be part of a domain. Both commander and standby commander switches should have an IP address assigned to them. 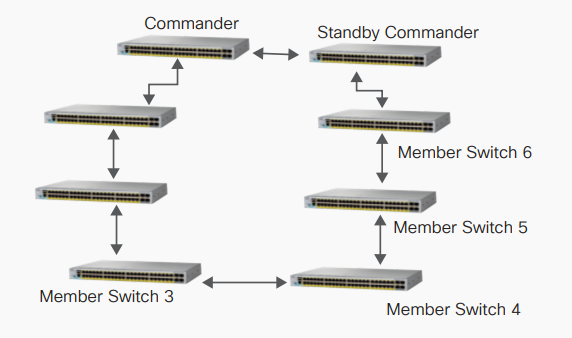 There should be at least one common VLAN between the commander, standby commander, and all the members switches. A switch can only be part of a single cluster at any given instance. As a best practice, it is recommended that two interconnections exist between the switches to make sure that connectivity is maintained in case of a port or link failure. Switches can be interconnected to each other on either downlink or uplink ports. While creating such cluster domains, all the switches can be interconnected through either a star topology or a ring topology. Figures2 and 3 represent two examples of how switches can be interconnected to form a domain.